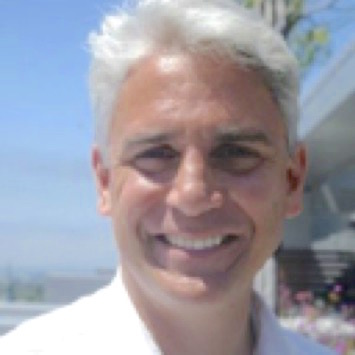 Errol Arkilic was the lead program director for the National Science Foundation I-Corps, which uses my Lean LaunchPad curriculum to teach scientists and engineers how to take their technology out of the lab and into the marketplace. Today he is the founder of M34 Capital, a seed capital fund that focuses on early-stage projects being spun out of academic and corporate research labs. The I-Corps had a serendipitous start. Errol explains in this clip. Errol: There was a unique opportunity in 2011 when the new director of National Science Foundation said, ‘We want to do something new and different [in helping scientists commercialize their technology].’ … He charged me .. to put together a mentorship program [for academic scientists]. We floated that around the office for about a week and said there was no way that that’s going to work. We had to do something different. 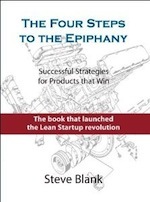 And right about that time you were publishing your notes to the Lean LaunchPad course in spring of 2011, Stanford, E245. … There was a blog post that you wrote … describing the first class at Stanford. I read it and I ran thing down the hall and said to my colleagues, ‘You’ve got to go read this.’ There was one element of the blog post where you described how you were teaching entrepreneurship like we were teaching art. You were going to give them deep lessons of theory and then you were going to dump them in the deep end, so to speak [and give them experiential practice.] That paragraph really resonated with a bunch of us at NSF, me included. Steve: …This is the first time I’m hearing the other side of it, … that you actually had a charter .. to do something different. From my side … I wrote the book [The Four Steps to the Epiphany], and while all the theory was in there, you couldn’t just hand somebody the book and expect them to do something. 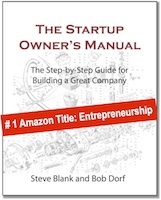 … We needed a way to teach entrepreneurship that was experiential and hands-on. And much like the educational paradigm, I can tell you about it all the time, but if I actually make you do it, it’s going to stick a lot more. 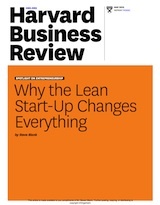 The Lean LaunchPad class.. was an experiment that no one had ever run before. [Up until then] the capstone class – meaning the best class you could take for being an entrepreneur in a university – was how to write a business plan. Yet we all [anyone teaching who actually had founded a company] knew that in all honesty no business plan survives first contact with customers. But nothing else like [The Lean LaunchPad class] was being taught. This [Lean LaunchPad class] was to me a major science experiment – having teams come in, write a business model, talk to 10 customers a week, have them present their results every week and actually be testing a series of of hypotheses. And the blog you were reading, [was created because] I thought that the class was so crazy and different I … wanted to share what I was doing [with other educators]. And since I open source everything I do, you were the recipient of open source. I have to tell you that everybody who knew me said, ‘Steve these are the most boring blogs you’ll ever write. No one cares about a new class, and no one’s going to ever read them.’ The good news is that for any of you who ever wanted to publish something Errol is a great example of what happens if there is only one person who reads what you write. Something magical could happen. So that’s when you picked up the phone and called. I was ready to hang up on the call until you said there are 10,000 potential scientists [who could be my students.] In my career, the most fun I ever had was working with and selling to people who were doing truly rocket science. I had to learn what they were doing to be able to understand how to sell to them … [so teaching a class for the NSF] was a new opportunity – could I figure out if we could take rocket scientists and teach them the basics of how to build a business. Errol: And we did. And I think that the principles of the scientific method applied to the commercial opportunity is spot on. That’s what scientists and engineers needed to embrace. What made him call Steve? We started the interview process like most people – [we] asked about the idea and the status of the technology was and got spun up on the story. We pretty quickly identified that was the wrong way to go. Because really what we needed were teams that were totally aligned with one another and could work together under extreme pressure and extreme ambiguity because the ideas change anyway. … The teams that are coming together to investigate their commercial opportunity, they need to look way beyond the technical boundaries of their discipline to see if there is a business there. … The key thing is that we’re trying to take teams on a journey with us and with one anther, and some people are not amenable to change and not amenable to coaching and not amenable to advice. Steve: … If I remember, you and I brought on Georgia Tech, and then University of Michigan and then how many more? Steve: We’re losing count, but there’s a bunch of them now that started from that phone call. 550 teams; 20 universities [as nodes and another 36 as sites]; must be 30-40-50 instructors now playing Steve Blank. This kind of makes it one of the largest accelerators in the United States, probably up there with TechStars and Y Combinator except it’s a U.S. government accelerator that takes \ no equity. So, Errol, congratulations, you’ve created something wonderful. I think the strong takeaway is that the commercial considerations must be done in parallel with the technical considerations. It’s not an after thought, it’s not something you come in later and tack on the end. If your goal is to get the technology out of the lab, it’s never too early to start thinking who the customer for that solution is. … If you are a scientist and you think that your science is addressing human needs, you better be talking to some humans. … I think the most rewarding element of the Innovation Corps is when a principle investigator comes back and says, ‘I’m now changing the way I think about crafting my research moving forward.’ That feedback is an incredible demonstration of a significant change.